The term dimorphic refers to a 'specialised' type of tessellation, whereby the tiling unit, by way of its 'line arrangement', permits the possibility of two distinct ways of being 'stacked' as a tessellation, this being in contrast to most tiles whereby only one such stacking is possible. Because of this feature, two distinct tessellations thus arise from a single tile. Such a property is very rare, and so consequently of more interest than any arbitrary tessellation. 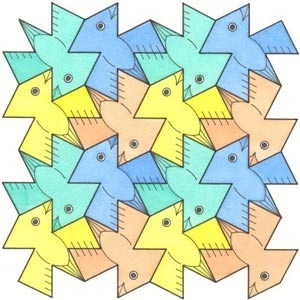 However, not until relatively recent years (1977), with an article by H. Harborth in the Mathematical Gazette, were such specialised tessellations studied. However, subsequently, Grünbaum and Shephard undertook the first considered approach, in the book Tilings and Patterns, pages 46-49, albeit the background to these, and indeed the whole book, is of a decidedly advanced nature, albeit much is still readily accessible to lesser mathematicians. Further articles on the subject can also be found with George E. Martin and Anne Fontaine in Journal of Combinatorial Theory and Mathematics Magazine. Now, due to the above stated rarity factor, any tile which possesses this feature is thus of more interest than for any given, arbitrary tile. However, is hard to find any such examples at all. Therefore, the addition of life-like motifs is of more interest than in normal circumstances. The example below uses a dimorphic tile apparently devised by Percy MacMahon, of which I myself show a bird motif 'of sorts', albeit somewhat limited as regards the quality – various shortcomings can be seen here, such as the head being considerably out of proportion. However, of necessity, such matters have to be essentially accepted on this particular occasion, due to the factors detailed above. In normal circumstances such a relatively poor quality bird motif would be deemed 'borderline' as to whether or not I would produce a 'finished' example, as here. However, due to the above detailed 'rarity' factor, such perceived shortcomings can indeed be justifiably overlooked on occasions, as with this example. 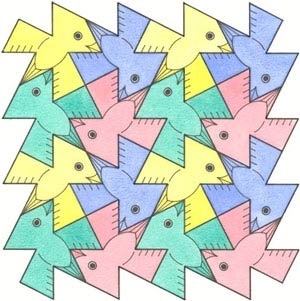 A minimum of two colours is required for both tessellations. In retrospect, when taken as a 'paired colouring', as was intended, the colouring scheme is somewhat poor. Firstly, although the choice of four colours is consistent, this is only ideal for (a), as the motifs appear in four orientations. In contrast, (b) has the motifs in only two orientations, thereby inconsistencies thus occur. Furthermore, the colours chosen are different between the two. Again, inconsistencies thus occur.